We want to be sure that your cat is healthy enough to stay with us for the duration of the radioiodine treatment period. 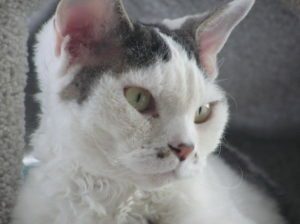 If your cat has previously been treated with medication for hyperthyroidism (Felimazole, methimazole, carbimazole, or PTU), it is important that the drug has been discontinued for at least 7 - 14 days prior to treatment with radioiodine. The morning of your cat’s scheduled treatment, you will have an appointment scheduled for your cat to be examined by Dr. Currigan. The doctor will then provide a presentation about the radioiodine procedure, including both your responsibilities regarding after care and ours while your cat is hospitalized. Many owners find that they have additional questions during this presentation, and we are happy to answer any and all questions. Your confidence in our care for your cat is essential. We ask cat owners to bring enough food for the duration of the hospitalization period, especially if your cat is on a less common or unique diet that we may not carry. Many cats are more inclined to eat well while away from home if the diet is familiar. Although we are unable to accommodate larger toys, bedding, blankets, etc. from home as our safety guidelines and space will not always allow these items to return home with you, we do encourage owners to bring a small toy and/or piece of clothing (such as an old T-shirt) that we can keep in your cat's housing area to help reduce any anxiety. (Note that due to safety guidelines, we may not be able to send these items home with you, however). No fasting is necessary prior to radioiodine treatment, so go ahead and feed your cat on the day of admission. All, or at least the majority, of the tests that we want completed prior to admission day should have already been done. However, if further tests are required, they can be performed by us, but in some cases, that may necessitate our having to postpone the treatment to another day. Once admitted to our facility, your cat will receive a mild anti-emetic (anti-vomiting) medication that also helps to relax him or her. We want to be sure that the cat does not vomit the radioiodine once given. We are also not hesitant to administer additional anti-anxiety medication – at any time throughout the treatment period – if we feel it would make your cat more comfortable. (Most patients ‘opt in’, not surprisingly, to receiving help in reducing their anxiety!). The radioiodine is given as a single oral dose of radioiodine on the day that your cat is admitted. After the treatment is administered, your kitty is placed in a special, lead-lined radiation isolation ward (as required by law), away from other animals not receiving this treatment. During the hospitalization stay, which is usually 2-5 days, your cat’s radiation levels and other vital signs are monitored closely. We will send pictures and updates to patient owners by email or text daily. Owners are always welcome to call Cat Hospital of Chicago as well for updates. We understand how much you miss having your furry friend by your side! 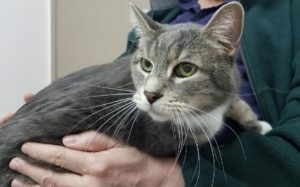 Although it is unlikely that radioiodine patients will become ill during their hospitalization with us, we know that most hyperthyroid patients are senior and geriatric cats, and not uncommonly, they have other health issues in addition to their thyroid disease. Any patient that becomes ill, even critically, while hospitalized for radioiodine treatment, will receive full care with arrangements made to minimize radiation exposure to our personnel. Rest assured that needed treatment will not be denied. Once your cat’s radiation levels have declined below the maximum allowed by federal and state law prior to being released from the hospital (usually 2-5 days), your cat is able to return home. However, your cat will still have a low amount of radiation in his or her body. You may be surprised to know that this amount of radiation is far less than what you would have if you were treated with radioiodine, and is very similar to the amount of radiation that you might receive if you flew across the country in an airplane! Nonetheless, because there is still some radiation in your cat’s body (and most cats do not use toilets, at least not 100% of the time! 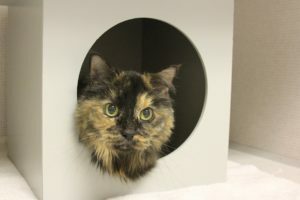 ), there are legal requirements for owners once the cats are at home, so we want you to exercise caution during the first week or two at home. Your cat must be discharged in a non-cardboard carrier. Your cat cannot be carried or transported loose in the car on the way home. The small amount of remaining radioactivity in your cat will gradually disappear over the first 1-3 weeks after being released from radioiodine treatment. Until this is complete, however, your cat will emit very low levels of radiation. Because of this, we also require that you isolate your cat for the first week at home (two weeks if children are living in the home, or if you are pregnant). The isolation can be any spare room in the house, but it should be one without heavy human traffic. We also ask that you limit your contact with your cat during this at-home isolation period to no more than 30 minutes daily (10 minutes three times daily). During this contact time, snuggling with your cat is discouraged. Instead, petting your cat at arm’s length from you is the safest approach. We understand that this is an emotionally difficult requirement for most cat owners – we all want to snuggle with our companions, especially when they’ve been away from home for several days – but our concern is your safety, too. We acknowledge that the home quarantine period can be challenging, especially in many of our smaller Chicagoland condos and apartments. We have had patient owners share a few ‘creative quarantine’ ideas, however, including use of a large wire cage/cat playpen (with or without shelving). The cage is placed in an area with minimal human traffic (humans need to keep at least a 3 foot distance from the playpen for all but 30 minutes daily when the cat is fed, litter scooped, etc.). Another cat owner quarantined herself in her bedroom, allowing the cat to roam the rest of the apartment. She left the bedroom only to leave for work and grab a quick bite to eat – other than her 30 minutes of allotted time daily outside the bedroom. Much of the residual radioactivity will be eliminated through your cat’s urine and feces. Therefore, we ask that you provide your cat with flushable scoopable litter. Use plastic liners in the litter box and flush waste products at least twice daily. After changing the litter, wash your hands thoroughly. The litter cannot be emptied into the garbage with your regular trash for the first week following hospital release as it may set off radiation detectors in the landfill, which could result in an investigation. Children under the age of 18 and pregnant women should not have any contact with your cat or his/her waste products for at least 2 weeks after release from Hypurrthyroid Treatment for Cats. Although we do not generally recommend boarding of our radioiodine patients beyond the required time period, if home quarantine for whatever reason is not possible, and the cat is comfortable and eating well in the nuclear ward, we will consider boarding for the quarantine period. Additional daily charges apply. Please ask for further details. The cost for any treatment for feline hyperthyroidism is significant. The fee for radioiodine therapy is $1510, but it may be more if the hyperthyroidism is severe and/or if pre-radioiodine diagnostics have not been completed. This fee includes the radioiodine itself, the cost of hospitalization and monitoring, blood pressure measurements as needed throughout your cat’s stay, and any oral anti-anxiety medications or appetite stimulants required while hospitalized. Any additional treatments required during the hospitalization stay would result in additional fees. Boarding beyond the initial hospitalization period would also result in additional fees. While this is a higher upfront cost than other options, it is less expensive than other options over the lifetime of the cat. Radioiodine treatment generally results in fewer thyroid blood tests for the remainder of the cat’s life as well, which makes the treatment more cat-friendly from the patient’s point of view as well. Please note: Because we must order the dose of radioiodine before the treatment is administered, and the dosage is tailored specifically for your cat, cancellation of a scheduled appointment less than 72 hours before the appointment time will result in a charge of $300.